Since I posted about this Lunch ‘n’ Learn you have asked so many questions! The format of the Lunch ‘n’ Learn will be custom to your company. 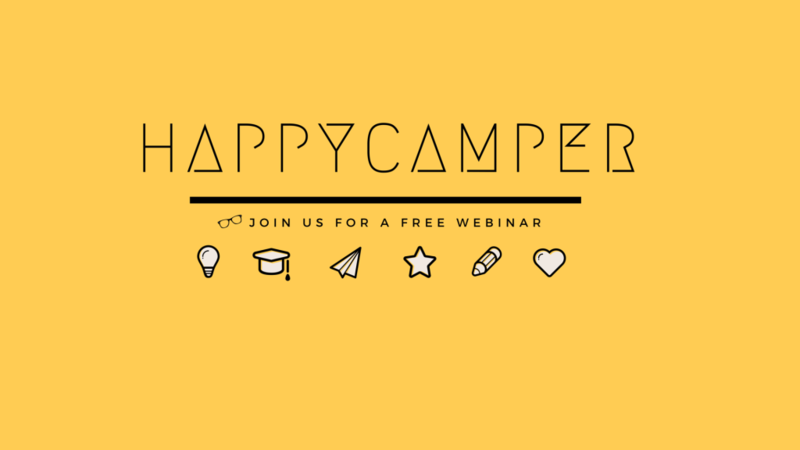 The basics that we will cover is the HappyCamper EQ model and how to use it at work to improve relationships with co-worker and customers. The standard format is a Skype video chat and I’m also happy to book in person sessions as well. The organizer(s) of the lunch and I will have a 30 min. pre-session planning call or Skype to discuss your particular needs, which may include running a current business issue through the model together at the lunch. This can be very fun and enlightening for your team. I am also happy to do a live Q&A. How does EQ help me succeed? I will be answering all of these questions with more depth in upcoming blog posts, for now, here are the simple answers. Q. What exactly is EQ? It’s how well you can get along with others. Your empathy, compassion, curiosity, understanding, listening ability, they all play into it. Q. Why do you need it? A. Well I suppose you don’t if you are a hermit and don’t ever plan on being around people. It makes your life easier. Consider it human interaction navigation ability. In other words, the ability to get what you want out of life and out of relationships. Now, this isn’t manipulation, it’s genuine empathy and compassion that will lead to success. Q. Can you measure it? A. Yes. There are many different assessments that you can take including ones that you send to those around you so that they can assess you from their experience. Sounds scary doesn’t it. How would you like to know what others think of your emotional intelligence? In a study by Føllesdal, the MSCEIT test results of 111 business leaders were compared with how their employees described their leader. It was found that there were no correlations between a leader’s test results and how he or she was rated by the employees, with regard to empathy, ability to motivate, and leader effectiveness. That means that most of us perceive our EQ/EI very differently than those who interact with you. That’s why as of today, April, 9th, 2015, there is no standardized test for EQ like there is for IQ. I’ll be sharing links to assessments in another post that talks about them in more depth. Q. How does EQ help me succeed? A. Emotional intelligence is predictive of stress management. Wether you are a mom at home, an NFL player, a contractor, a yoga instructor, a corporate lawyer, or an entrepreneur, we all experience stress. How we handle this stress, especially when interacting with others is vital to our daily performance. Careerbuilder survey: 71% of employers say they value emotional intelligence over IQ. In a study of Pararescue Jumpers, the US Air Force saved $190 million by selecting candidates based on emotional intelligence. Those who can best manage the stress of simply being human in a world full of humans will be more at peace with themselves and in groups. Q. What is the science behind this? A. Wow, there is so much depending upon the angle you are talking about. You could have the science and data to make a business case and ROI on EQ/EI and employees, or the neurological science, or the educational science of how it’s best learned and taught. We’ll cover all of this in upcoming posts. For now, here’s an interesting blurb about Self-Esteem and Drug Use. Self-Esteem is a very big part of EQ. A 2012 study cross examined emotional intelligence, self-esteem, and marijuana dependence. Out of a sample of 200, 100 of which were dependent on cannabis and the other 100 emotionally healthy, the dependent group scored exceptionally low on EI when compared to the control group. They also found that the dependent group also scored low on self-esteem when compared to the control. Another study in 2010 examined whether or not low levels of EI had a relationship with the degree of drug and alcohol addiction. In the assessment of 103 residents in a drug rehabilitation center, they examined their EI along with other psychosocial factors in a one-month interval of treatment. They found that participants’ EI scores improved as their levels of addiction lessened as part of their treatment.